The Head of the Quebec Kingdom, Louis CCLLLLXXXXVVVVVVVI, often glances down at the commoners from the upper levels of his castle. When spring came, Champlain repaired his boat with birch bark and pine gum to hold everything together and sailed back to Europe after leaving a small settlement behind. Although the living conditions were harsh, the French people were happy and learned to communicate with the neighboring Hurons and Algonquins with body language, smiles and punches, and shared their tradition of smoking weed in a calumet. 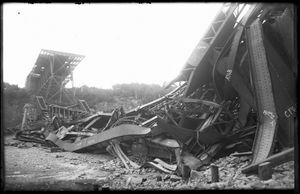 Everything was fine and dandy until the wretched Englishmen came to soil the land with their foul breath and wars. 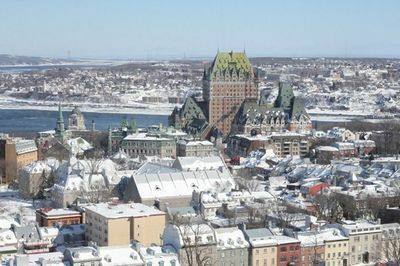 Quebec City is the second biggest agglomeration to use the French language in North America thanks to a population of one million sash wearers, but could very well steal the top spot from Montreal soon since English-speaking people are multiplying down there like monkeys in mating season. 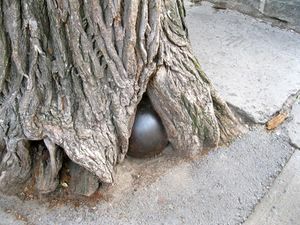 However, there are a few English pockets in Quebec City, most notably the jail and the asylum. There is no racism and no ghettos in the city, which is remarkable considering its size: the Black and Asian minorities are blending perfectly (as perfectly as black can blend in a white background) and numerous sightings are routinely reported anywhere in the town, for the immigrants see no point in living clogged together in a community that accepts them so openly. However, should a full sentence pronounced in English come to the ears of a Police officer or a benevolent Vigilante (99% of the population), ID cards are immediately demanded, whether the person is white, black or blue. If the suspects have been staying in Quebec City for more than 2 years and have not yet learned French to a level that is satisfactory, they are accused of the latest unsolved crime and shipped back to wherever they came from. Et voilà! 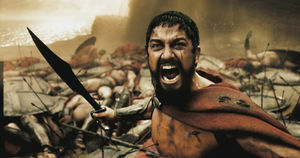 Bon débarras! 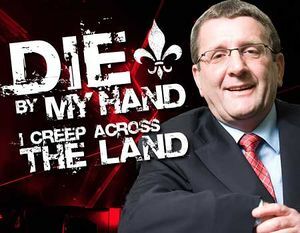 Dictator by day, house burglar and hitman by night, mayor Régis Labeaume is hugely popular in the city and will be the Dear Leader for life, or at least until he finally gets a NHL hockey team to come back in town. A big reason for his success is his straight talk and populist language (see quote above). He was infuriated when the Canadian government, which had promised to help the hockey team's return before the elections, turned its back on Quebec's people once the election was over by backpedaling and refusing to contribute one cent toward a new arena. In a moment of holy anger, the mayor spoke aloud (and very publicly) what everybody thought but would not say about the Canada's representative for Quebec City, Josée Verner. He stated that she was "an old, hypocritical cow" and that "there are times where I just feel like beating the heck out of her." This passionate rant gained him 25 points in the polls, but elicited his usual half-assed apology: "Sorry, I got a bit carried away there..."
The charming street, covered with centenary trees, is quite a sight during daytime: beautiful women, old buildings, centenary trees, fat women and centenary trees are part of the scenery. At night, things tend to be a little more hectic, especially at exactly 3 a.m., when the street's 64 bars close simultaneously. The sudden flow of drunkards can do just about anything, since the police union is so strong that there is no night shift. The city merely rebuilds the street and washes away the puke, as English-speaking tourists help replenish the government coffers when hospitalized for brutal, alcohol-fueled attacks. Healthcare may be free for the natives, but the government compensates by charging $1,000 per stitch to foreigners and encourages its people to 'hit to a bloody pulp'. No winter could be complete in the city without a good public showing of mass drunkenness. The Carnaval is vital to the region's agriculturo-culturo-historico-economical industry, since a scary amount of alcohol is consumed. 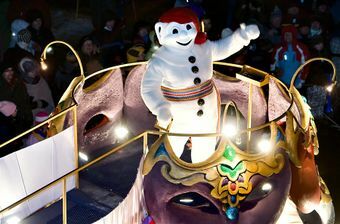 A bunch of Carnaval floats roam through the streets, la pièce de résistance being the Bonhomme Carnaval himself, a mascot that is steel-plated to withstand the crowd's massive abuse. The problem with the parade is that people throwing their empty beer bottles from the sidewalk may miss the mascot and put in jeopardy the bottle-throwers on the other side. But as alcohol is a good anesthetic, the pleasure of taking aim at the mascot far outweigh the occasional shattering of beer bottles on a reveler's face. The city officials, being very concerned about the health hazards of the situation, took a step in the right direction in 2012, distributing free plastic bottles of 40% alcohol, which knocks out the revelers in a jiffy and produces a lot less empty containers. Bulldozer operators do good business the next day, cleaning the streets of frozen human debris. This page was last edited on 29 May 2018, at 19:42.